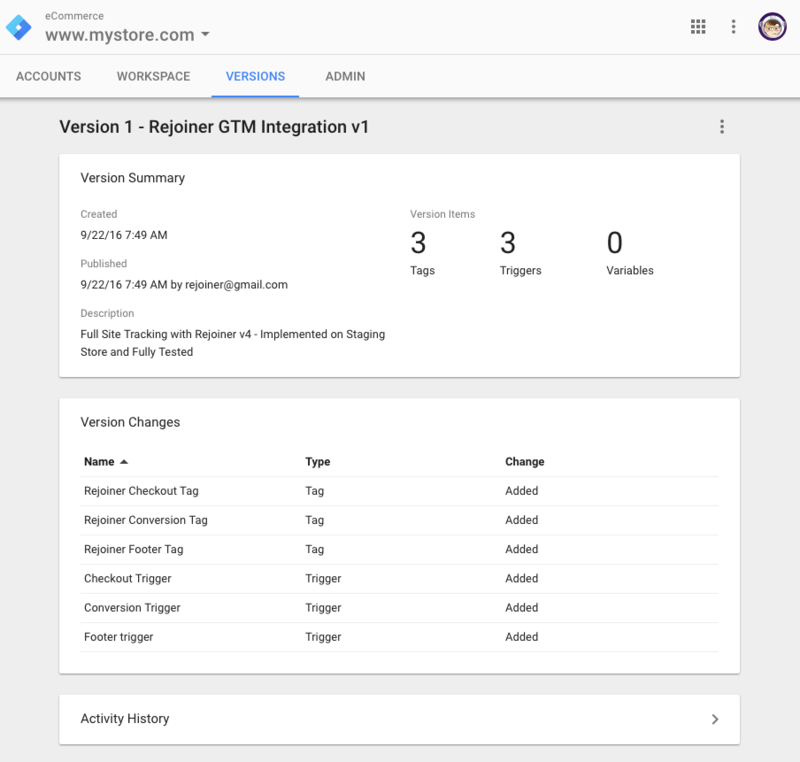 This article describes integrating Rejoiner using Google Tag Manager for Rejoiner's v4 Implementation. If you're looking for v3, click here. 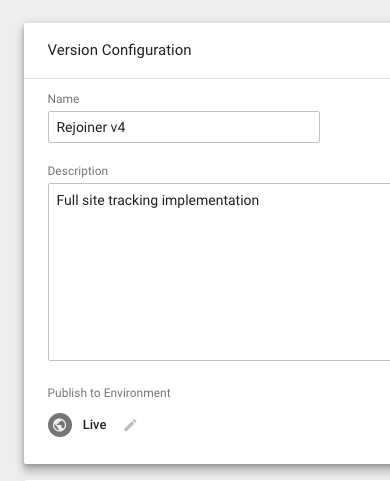 This article describes the implementation of Full Site Tracking (v4) with Rejoiner using Google Tag Manager. This means that you will use GTM to configure the integration, as opposed to embedding our JS directly in your store. 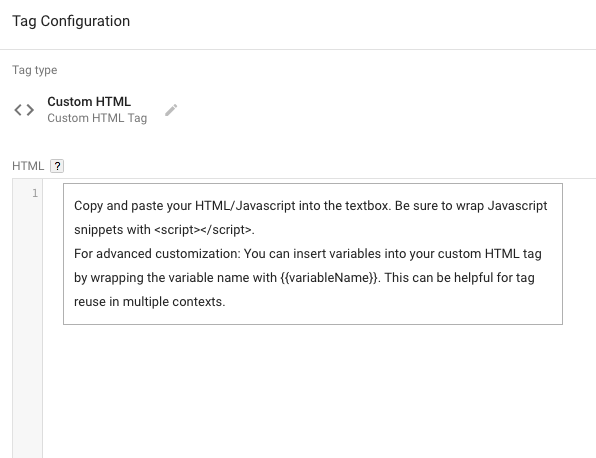 Google Tag Manager uses "containers" to manage separate integrations. This way it will be easier to test and deploy the Rejoiner integration without affecting your other integrations. Start by creating a new container using the video below. Note: You will need to add the container snippet to your site. You will need to remove any existing Rejoiner tags – if any. 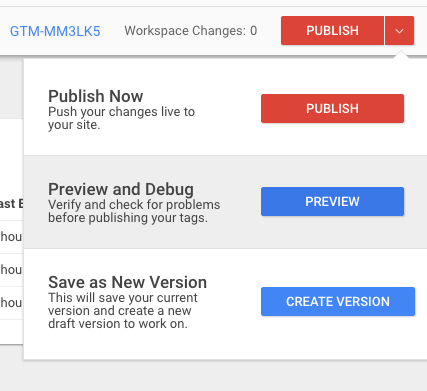 At this point, we assume that the Data Layer in Google Tag Manager integration is already configured. See Developer Guide and Enhanced Ecommerce for more details and examples. While you do not need a Data Layer to track browse abandonment, cart abandonment and conversions we highly recommend you use a Data Layer – otherwise, you will have no access to product and cart data details. Note: The actual format of the Data Layer will vary from store to store. This means that the code responsible for translating data from the Data Layer to Rejoiner API will have to be customized. Rejoiner will also need the following elements to be present in the Data Layer of your cart page, checkout page, and order receipt page. To start, we will prepare the triggers we will be needing in this integration. There are only 3 triggers you will need to create. Below is a table with these triggers. The name of each links to specific details about the trigger. To help you, we created the video tutorial below to walk you through creating your triggers. We recommend you watch it before going into the next steps, specially if you’re new to GTM. Name your trigger. Remember to be descriptive. Click on the pencil icon of the Trigger Configuration box to open your trigger's settings. In the settings, select the Page View trigger type. Select All Pages for your Footer Trigger. Select Some Page Views for your Checkout and Conversion Triggers. Next, you'll want to use the dropdown to create your trigger conditions. Make sure the URL matches correctly. Thus, you’ll be leaving out the “customized” portion of the receipt URL. Last step is to click on the blue button labeled as "Save" to finish setting up your trigger. We recommend you name your trigger as “Checkout Trigger” in order to easily recognize it as we’ll be needing it later. 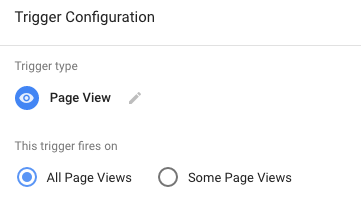 Make sure you’ve selected the Page View trigger type to fire in Some Page Views in the Configuration Settings. Make sure the URL matches the checkout address your users will see in their browser’s address bar. We recommend you name your trigger as “Conversion Trigger” in order to easily recognize it as we’ll be needing it later. 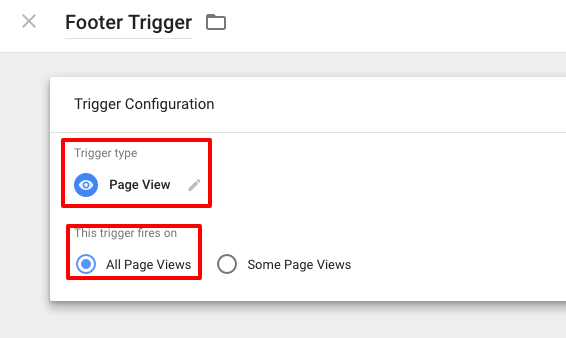 Make sure you’ve selected the Page View trigger type to fire in Some Page Views in the Configuration Settings. Make sure the URL matches the receipt page your customers see upon completing an order. We recommend you name your trigger as “Footer Trigger” in order to easily recognize it as we’ll be needing it later. 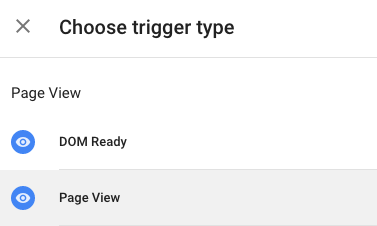 Make sure you’ve selected the Page View trigger type to fire in All Pages in the Configuration Settings. 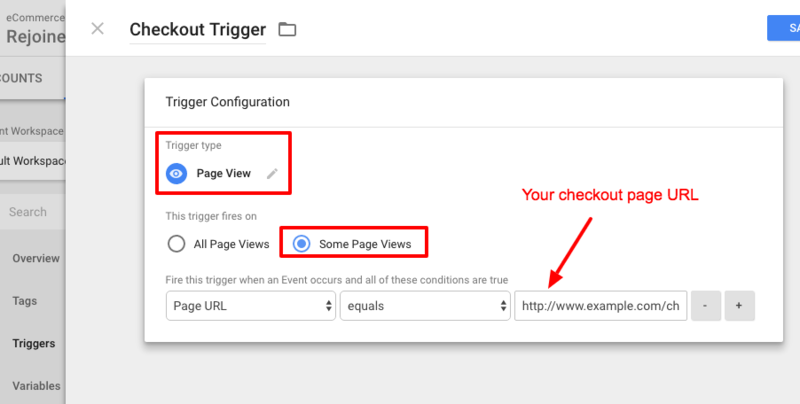 By selecting “All Page Views” we’re telling GTM that the Footer Tag, which we will later attach to this trigger, needs to be present in all the pages of your site. Create a new tag by clicking on the red button labeled as "New"
Name your tag. Be descriptive, we also recommend you note that the tag is for Rejoiner by including this in your name. Example: "Rejoiner Checkout Tag"
Your Custom HTML Configuration will appear. you will want to add the tag's corresponding snippet to the HTML box. The needed snippets and details for each tag are located below. Finally click "Save" in order to complete your tag's set up. Add your checkout snippet to your HTML box. Below you’ll see two variants of the snippet. Use the one that best suits your needs. Note: The Custom Data Layer part on the second example is optional and can only be used if you have provided required information in dataLayer variable. Make sure to fill correct values in setAccount and setDomain calls (available in the Implementation tab). This tracking code translates your Data Layer into Rejoiner calls (see API documentation). This code will be specific to the Data Layer structure that is used in your store. The Rejoiner Conversion Tag is responsible for closing successful orders so that a recovery campaign will not be triggered. The configuration is very similar to the checkout tag. Add your conversion snippet below to your HTML box. IMPORTANT: Remember to fill in the correct values for your setAccount and setDomain as they appear in your account’s Implementation. Add your footer (tracking) snippet below to your HTML box. Once you have verified that the image above matches, we are ready to deploy. We recommend to first test the integration using the Preview & Debug mode. Once you’ve tested, click on the red button labeled as “Publish” to deploy your integration. Next add a “Name” and a “Description” inside your Version Configuration. This should help recognize changes made specifically for Versioning. Thus, we recommend you’re descriptive. Make sure you’re deploying to the right environment. Next click on the blue button labeled as “Publish” to complete your deployment. Here are instructions on how to test your v4 integration. Email support@rejoiner.com if you need help at any point.